Green Giant is now celebrating the 40th anniversary of Earth Day by giving $200,000 to The Nature Conservancy to help fund an innovative project that will encourage greener farming practices to repair and protect a natural treasure - the Root River, one of Minnesota´s (Green Giant's home) best trout streams. Learn more about Green Giant´s sustainability program or make a donation to The Nature Conservancy, visit HERE during the month of April. 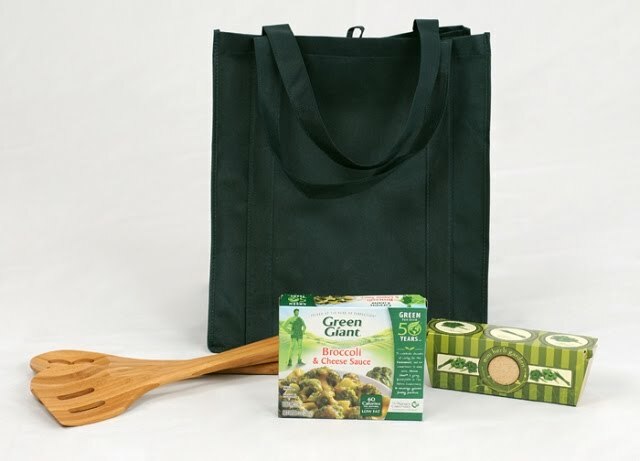 To motivate everyone to be green, Green Giant is holding a little giveaway. First they sent me this and then shared that I can give one away too!! Very cool! I only have one rule this time (shocking, I know!) - tell me how you are trying to be green for Earth Day. You get one entry for your comment and one entry tweeting about the giveaway (make sure you include me @allthelilstuff). I try to be greener anyway. I keep re-usable bags in my car, and I helped start a recycling program at my work. My newest efforts are to try to remember to bring my bags when I'm gonna be shopping in someone else's car and to bring a bag for recycling cans and bottles when I'm on the road for work. I'm recycling cans all week long (even though I do it all year) but I'm also turning in plastic bottles and bags this week for the first time! I always carry reusable bags in my purse. We pick up cans and bottles to recycle during our walks. We compost and save rain water. We love giving reusable bags as gifts to our friends. I try to be greener in a ton of ways; including not printing school assignments (submitting by email), I grow some of my own veggies, and I use newspapers for my ferrets litter. =] Oh and I always, always, always recycle! Recycle aluminum cans, newspapers, etc. Shopping at second hand stores and garage sales...buying used instead of new at times.